Four-acre attraction created by a Benedictine monk, features 125 "miniatures, reproductions of famous churches, shrines and buildings." Completed in 1958. Bronze statues of the Stations stretch across a 0.75 mile walking path. 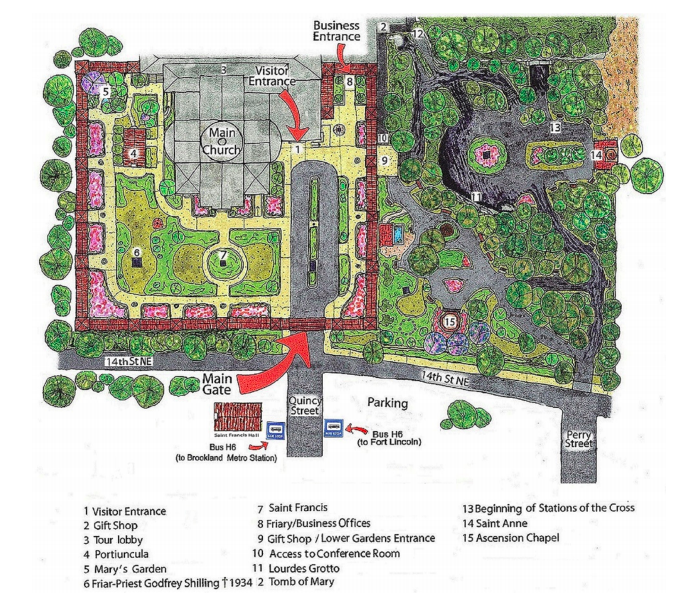 Multiple statue gardens (e.g., Jesus praying in the Garden of Gethsemane) and a 0.5 mile Stations of the Cross walking path. Replica of Italy shrine, now housed inside the Church of Loretto at St. Mary's College. Composed of various materials, including precious stones and minerals, this Catholic shrine depicts biblical scenes such as the Garden of Eden, Moses and the 10 Commandments, Bethlehem stable, Nazareth, Sermon on the Mount, Garden of Gethsemane, and the Stations of the Cross. Completed in 1954. Located on the campus of Mount Mercy University, the Grotto includes several Marian biblical replicas. Completed 1941. Replica includes relics from the original shrine in Italy. Replica of the 28 stairs in Rome that are, according to Catholic tradition, the steps Jesus ascended to meet Pontius Pilate and were brought to Rome in the 4th century. 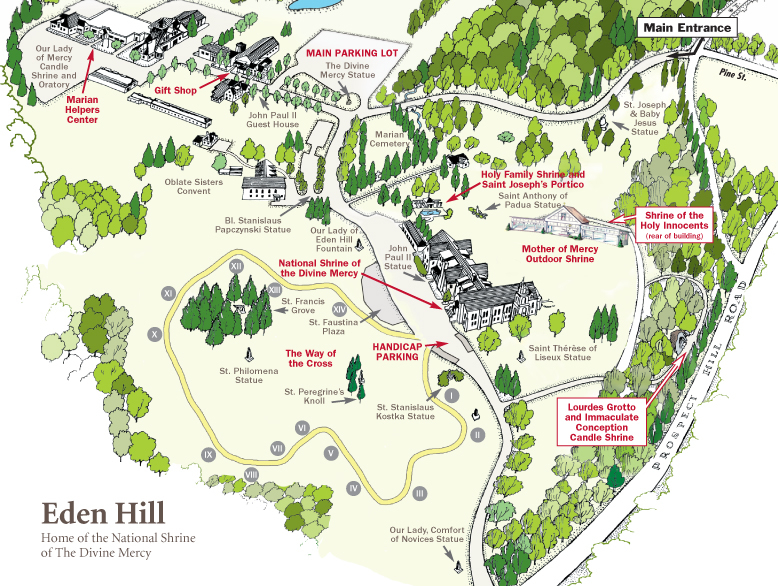 "Life-size" Stations of the Cross presented as bronze sculptures on 350 acres of land. Built in 2009. View the 3-minute film on the site for a glimpse into the site's production. Also features a 28 foot tall, 7 ton crucified Christ. Integrates Holy Land materials and claims exact distance between final stations as Jerusalem original. Completed 1936. Loreto replica that includes "stones from the actual Holy House in Italy were pulverized and added to the mortar used to construct the Holy House Chapel." 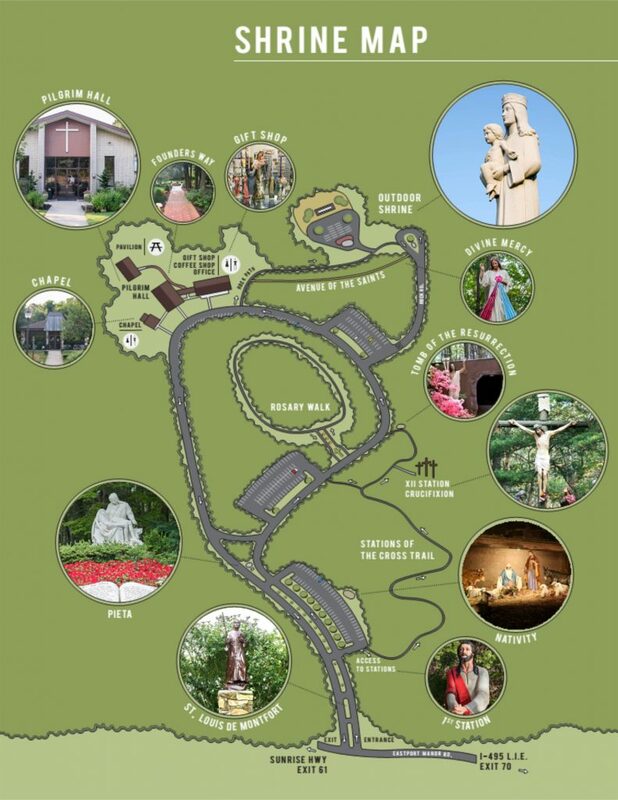 Quarter-mile Stations of the Cross walking path, Holy Stairs, Resurrection and Nativity replicas. 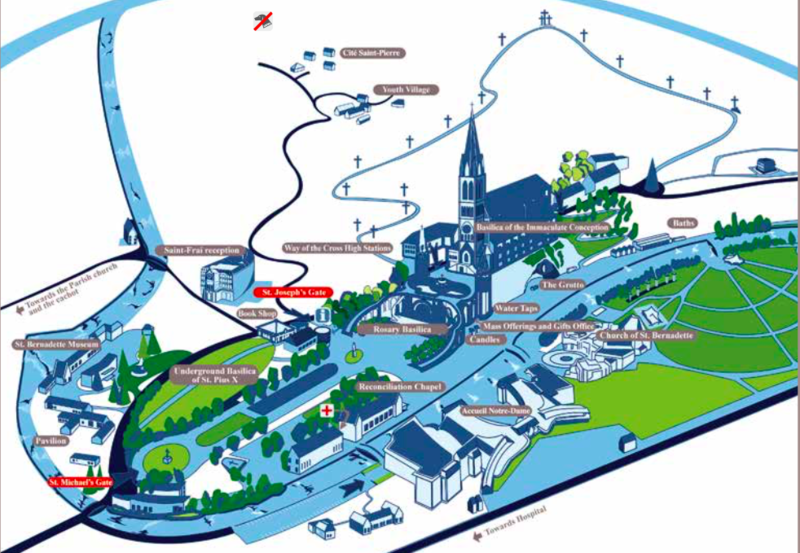 Part of a Lourdes replica complex. 30+ grottos on 120 acres, including scenes from the life of Jesus. A ministry of the Friar Servants of Mary, this attraction includes marble and wood sculptures of biblical figures and a bronze Stations of the Cross set. Trappist monastery founded in 1949, gardens include several large biblical scenes carved out of fallen oak trees. Catholic site with various biblical replicas, including a Garden Tomb and Rachel's silent cry (Jeremiah 31:15). Replica of the Walsingham replica. Replica of the house in Ephesus, Turkey where, according to Catholic tradition, Mary lived just before her death as described in The Book of the Acts of the Apostles. Replicas include Stations of the Cross, Gethsemane Grotto, Bethlehem, Nazareth. Replicas of the 10 Commandments, Last Supper, Stations of the Cross, and Jesus' Crucifixion and Resurrection. Set on 17 acres, this "religious theme park" depicts 36 scenes in the life of Jesus and the streets of first century Jerusalem. UNESCO World Heritage site, home to life-sized baroque sculptures of scenes from the life of Jesus. Museum dedicated to the religious art of Aleijadinho. Shrine complex with three re-creations: Scala Sancta; Stations of the Cross (added in 1913); and on adjacent grounds the Cyclorama of Jerusalem (est. 1895). Replicas of the Holy House of Loreto, Scala Sancta (added in 1770), and Bethlehem nativity (added in 1922). Cistercian monastery that includes a painted wooden statue of Mary weeping over Jesus after his death, and a Calvary Hill replica. Concrete replacement of wood original installed in 1965. Holy House of Loreto replica, based on 1060 Marian apparition. Holy House of Loreto replica. Begins with Scala Sancta replica. 1500 meter path, with 115 cast iron figures. New Stations figures added 2001. Follow link to video with excellent views of the path. Catholic site "provides an absolutely refreshing and spirituality nourishing experience to the pilgrims. Civil structures are built in ancient architectural styles to give as much resemblance to the originals as possible." Catholic site featuring collections of sculpture, furniture, ivory, paintings, textiles, metals, and other items. Collection of shrines, built on site of 5th-century complex said to be a "New Jerusalem," that includes replications of Golgotha, the Stations of the Cross, and the place where Pilate sentenced Jesus. The oldest biblical replication catalogued in our project. Former convent turned religious art museum, housing numerous biblically themed paintings and sculptures. Housed at a Catholic church, this Holy Land includes a nativity scene and soil from Israel. 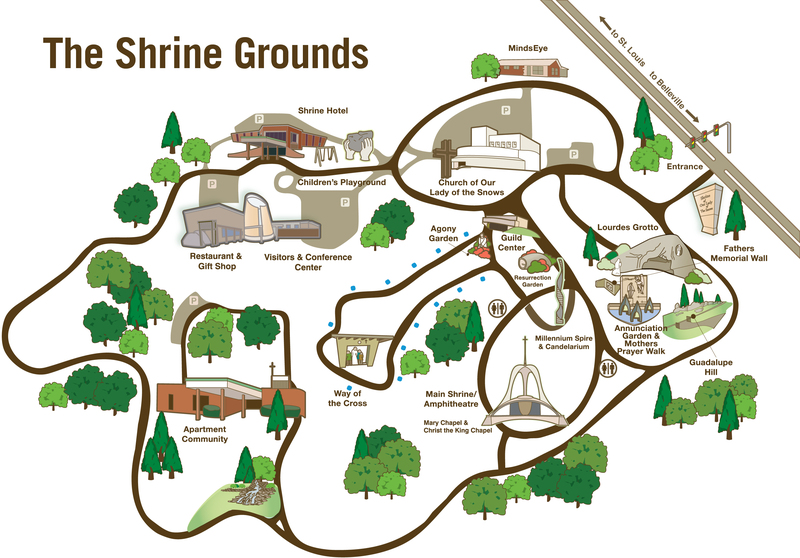 Designated a UNESCO site in 1999, this shrine is modeled on a 1584 map of Jerusalem. Shrine built to honor Marian apparition from the 1850s; includes replication of Stations of the Cross, Golgotha, and other biblical scenes. Integrates stones collected in Israel. Completed in 2004.